We are washi tape supplier with 16 years experiences. Our washi tape is use for cardmaking, scarpbooking, journals, DIY decoration etc. It is writable, tearable and no residue. We have different pattern of washi tape, glitter tape, foil washi tape, washi sheet & sticker for sale. Also customized with your own design and logo is welcomed. If you are interested in, i'll send you our catalogue for reference. 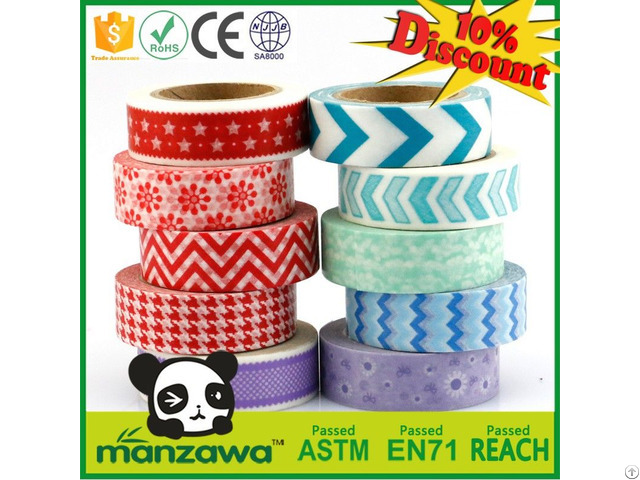 Posted By: Foshan Manzawa Adhesive Products Co., Ltd.
Our washi tape is use for cardmaking,scarpbooking,journals,DIY decoration etc. It is writable,tearable and no residue. We have different pattern of washi tape, glitter tape, foil washi tape,washi sheet & sticker for sale.